GaysTryst is a website for gays were they can safely and secure hookup and communicate with each other. The site produces a lot of positive emotions at first glance. The design of the service is pleasant and comfortable. How to Login to Gays Tryst? The GaysTryst.com homepage looks like a pretty and stylish picture of two young men who are hugging each other with tenderness. The design is the first thing that impresses. It looks stylish and pretty. 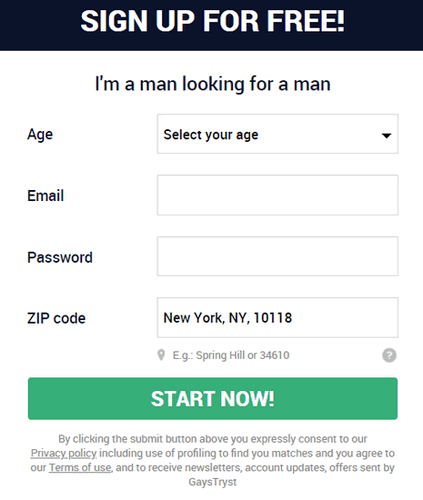 The homepage offers you to choose only one option: “I am a man looking for a man”. Next, you should specify your age, nickname, and location. Choose a password, and you are ready to go. The activation code that appears in your email in five minutes is required to verify your registration and email address. Next, the system offers you to upload a photo. You can skip this step, however, it is necessary for a successful experience on the website. The better the picture, the more chances of having an affair. Next, you should specify the title of your profile. Ethnicity, body type, and hair color. You can skip this step as well. The interface after the registration looks the same smooth as before the registration. There is a feed of users which you can choose and contact. Right after the registration, you receive a few messages even if your profile is not upgraded and you have no photos. This gives the idea that there can be bots on the website that stimulate people to start a conversation with each other. However, the user accounts don’t have a notion that they are special or at least differ from others. Terms and Conditions specify that there may appear bots, scripts, and other website agents. After half an hour of being registered on the website, you will receive around ten notifications on new messages from other accounts. Viewing matches is available for every gay hookup site, but here you can view matches without having an upgraded account. 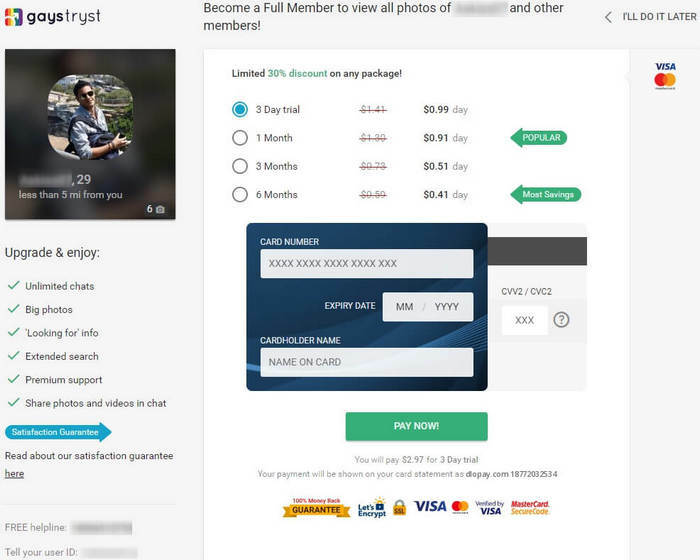 You can choose who to chat with and then upgrade your profile to a paid membership. This feature gives free members a chance to choose who they want to talk with and who don’t. If there are enough interesting accounts, it is worth taking a premium. Sending the same message to many people is very convenient because you can type the same text twice or three times, but you will save your time on typing if make it once and sent to at least ten people you like. Choose profiles that seem interesting to you and send mass emails to them just once. It improves chances for response. Chat rooms are the place where people can discuss something intimate but on the public. It can be anything. Chat rooms are a great place to find a gay person that seems interesting not only on the profile but also during the conversation with others. Or you can spend a nice evening chatting with others is a chat room. It may appear more involving than it seems. If you don’t like the way a certain user talks to you if you feel like you are talking to a scammer, or the user forces to talk to private topics which are inappropriate, there is an option to block that user and forget about him. You can report the user as well to the support representative. Checking online users is convenient if you want to have a conversation right now. You can go to the main page and choose only those who are online now. First, you will see those users who are online and new on the gay hookup site. Next, you will find only those who are online. The feature is convenient. You can do the same with new gay members. However, they are interesting to people who already know almost everyone on the platform. Premium members can watch all the photos posted by members of the GaysTryst. Another significant feature is a database of unlimited adult videos which members can watch and discuss. There is a great selection of videos and other content. The service is oriented on adult gay auditory that is older than 18 years old. There are people that are ready to meet, and they are special ones. The hookup site for gays is oriented not only on cutting online and watching adult content, but also on connecting people and manning them want to meet up each other in person. On the website, there is a special window with a map and pictures of people who want to hookup. You can find them on the main page. There are plenty of users on the site, but no counters saying how many of them you can see in the search result, how many are located on your area, how many are online, and other. With a free account, you can see around a few hundred men who are online. Note that some of them can be chatbots. It also depends on the day of the week, time, and others. There is always a person to chat with. One person can chat with only a few people at the same time. The GaysTryst offers enough options to find a man to have a hookup with. Otherwise, you can go to the chatroom or enjoy the content of the website. By providing a significant amount of information and attractive pictures, other members will contact you, and there will be no dead hours on the website. All the users look the same. They had little information and a few private photos visible for paid accounts and blurred for free ones. There is basic information such as age, location, marital status, hair color, ethnic origin, body type, and other appearance features for men. If some information is missing, you can ask the person to add this information to the profile. Bots are still under the questions. Usually, there are used to involve a person to a conversation, but in the future, the person can not differ a real member from a chatbot. Right after the registration with zero accounts, you will receive around ten messages that is by default suspicious. Everything is very simple in this gay hookup site. Some members are paid, others are free. There are supposedly chatbots as well. Free accounts have access to the limited site features while paid account have advanced feature and more opportunities onto the site. There is no verification and other types of accounts that are significantly different for the others. The users who have uploaded photos and detailed information about themselves appear higher in the search result and give the system more chances to apply filters. People who have new accounts and have paid their membership on the service appear hight in the search result. It is important to upgrade while the account is new to have more chances for connections. Once you create an account, you receive plenty of messages even if you have zero information on your account. There are two possible reasons for this. First, members of the service are using the advanced feature of balk update and send the same messages to all the new accounts to have more chances for response. Other reason can involve chatbots that are trying to involve new members into a conversation and ease first steps on the website. There is a very convenient and well-designed messenger on the service. Mass messages is another advanced way for fast and efficient communication. There are chat rooms where people can get to know each other fast and have fun. Chat rooms often have a very interesting direction of the conversation that makes in involving and catching. There is a pleasing option that includes three days trial with the access to all the features of the Gays Tryst. The trial costs only $2,97. It gives a chance to get familiar with the website on another level and check all the premium functions before buying a long-long-period membership. One month cost $24,99, three-month plan is $41,98, and six-month membership costs $65,94. The prices are affordable and cheap in comparison to other services where one month cost around $50. A free account gives plenty of opportunities to get familiar with the site for hookup and the main features. 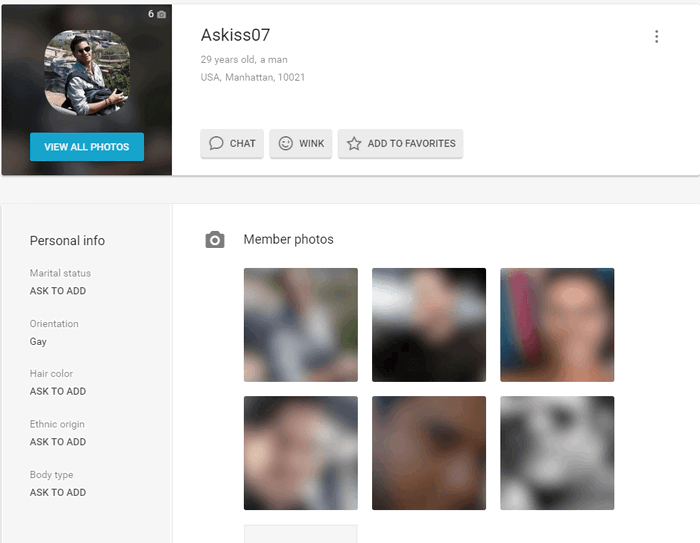 It allows to send a few invitation messages, check the filtering and search option, view profiles with blurred private photos and some of the details. It is also possible to visit chat rooms and check what is going on there. If you are not satisfied with a free account, you can but three-days membership and check everything you want to know including adult videos. Premium account is created to give members a chance to feel safe and secure with no limitations for viewing the content, private photos of other users, and adult content of the service. With premium account users feel safe, secure, and patient. They can chat every day and visit chat rooms without thinking about the number of messages they have already used. Premium account gives everything you need to enjoy your gay chatting experience and have a chance to meet a gay person in real life. You can buy it just to stop feeling uptight and enjoy the communication for free. 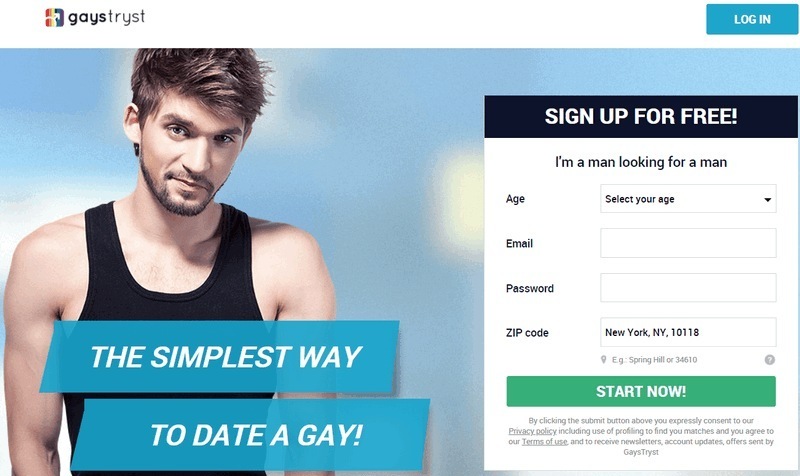 It is worth taking a premium on GaysTryst.com because it is impossible to have a positive experience with a free account. The site offers not only communication with other people, but also plenty of other advantages like chat rooms, where you can feel yourself free and express yourself in front of the others, adult video content, where you can find something new for your further experience, and fins more people who you can meet up in real life. These rules will help you to be safe and secure no matter who are you talking to. Unfortunately, there is no evidence of customer support. Some mentions of the positive customer experience are there, but no contents to ask questions, report users, and consult on the features of the site. It is necessary to write an email and wait until a representative of the company proceed it. There is an informative ‘support’ section that allows users to have a great experience without personal assistance. GaysTryst has an application on AppStore. This is the evidence of high quality site. A mobile app is convenient, user-friendly and very simple. Here you can chat, watch videos, log into chat rooms, and do the same thing you did in the browser version. The application for mobile devices is another level of website that is a rarity among hookup platforms. Most of them don’t adapt the website to mobile devices. It is definitely a great advantage for user experience, where they can allow sending push notifications and never miss interesting messages or new content. GaysTryst leaves a contradictive impression. On the one hand, chatbots send messages to accounts with zero information which is suspicious. To read the message, it is necessary to upgrade the account. On the other hand, three days trial can find out everything on the gay hookup site and discover all the features. Even if there are a lot of chatbots for communications, it helps many people to feel free in communication with others alike. GaysTryst review has revealed various pros and cons that we describe below.